In recognition of the consequential Eastern Shore history of Dr. Frederick (Bailey) Douglass, a special presentation will be made on Saturday, February 9, 2019 at the Caroline County Central Library in Historic Denton, Maryland detailing a previously unknown visit Douglass made to Caroline County in the fall of 1883. With the Frederick Douglass Bicentennial being celebrated and recognized throughout the country, and world, the local impact and significance of his life can often be overlooked. Based in Washington, D.C., local historian John Muller made headlines in the Star Democrat last September introducing and presenting research detailing previously unknown visits Douglass made to Cambridge in Dorchester County. The subject of biographies and focus of manuscripts for generations, including Young Frederick Douglass: The Maryland Years by Eastern Shore historian Dickson J. Preston, the fuller and more complete story of Dr. Douglass on the Shore has yet to be told. Join local history enthusiasts and community leaders for a debut presentation detailing a previously unknown high-profile visit Dr. Douglass made to Denton, Maryland, arriving by train, escorted through town by a brass band from Centreville, speaking at the old county courthouse and departing by boat. Following the presentation will be a Q&A. Denton Town Councilwoman Doncella Wilson, a native of Queen Anne’s County, will offer introductory remarks. Wilson is the founder of the FireFlies Denton, a community-based organization that recognizes outstanding youth and advocates, and serves in a variety of leadership roles and advocacy positions. John Muller is the author of Frederick Douglass in Washington, D.C: The Lion of Anacostia (2012) and Mark Twain in Washington, D.C.: The Adventures of a Capital Correspondent (2013) and is at work on Lost History: Frederick Douglass and Maryland’s Eastern Shore. He will be presenting “The Lost History of Frederick Douglass in Western Maryland” at the Washington County Central Library in Hagerstown February 12, 2019 and “Lost History: Frederick (Bailey) Douglass in Baltimore” at the Enoch Pratt Central Library in Baltimore on February 28, 2019. Invitations will be extended to Denton Mayor Abigail W. McNinch, members of the Denton Town Council, Caroline County Historical Society, Ridgley Historical Society, Maryland Commission on African-American History and Culture, Caroline County Office of Tourism, Caroline County Commissioners, elected officials within the Maryland State Senate and Maryland State Assembly representing Caroline County, Frederick Douglass National Historic Site, Howard University’s Moorland-Spingarn Research Center, University of Maryland-College Park, Salisbury University’s Edward H. Nabb Research Center, Dean of the Frederick Douglass Library at the University of Maryland Eastern Shore, Harriet Tubman Underground Railroad Byway, Harriet Tubman Underground Railroad Visitor Center, Maryland Humanities Council, National Museum of African-American History and Culture, Smithsonian Anacostia Community Museum, members of the Douglass and Bailey Family and others. The Caroline County Central Library is located in downtown Denton at First and Market Street. The library is easily accessible by car from Easton, Cambridge, Baltimore and Washington, D.C with a parking lot behind the library and available street parking throughout Denton. Denton, Maryland is the county seat of Caroline County, Maryland and includes stops on the Harriet Tubman Underground Railroad Byway. For more information on the program and/or directions please call 410.479.1343 or visit http://www.carolib.org/. Following the discovery and presentation of the “Lost History of Frederick Douglass in Cambridge, Maryland,” local historian John Muller will present on the unknown history of Frederick Douglass in Caroline County. Frederick Douglass rose from the depths of slavery on Maryland’s Eastern Shore to travel three continents and counsel a half-dozen Presidents. You may think you know his story but did you know Douglass visited Hagerstown?! Hear historian and author John Muller share never before published details of Dr. Frederick Douglass’ visit to Hagerstown walking the community and lodging in the historic Washington House. Using newly discovered information found in public and private archives, Muller will share information that uplifts the history of consequential visits Douglass made to Frederick City, Hagerstown and Cumberland, as well as lifelong associations Douglass had with abolitionists, politicians, and faith and community leaders of the Cumberland Valley region. John Muller, author of Frederick Douglass in Washington, D.C.: The Lion of Anacostia and Mark Twain in Washington, D.C.: The Adventures of a Capital Correspondent, will present “The Lost History of Frederick (Bailey) Douglass in Baltimore” using newly discovered information found in the Baltimore City Archives, Maryland Historical Society, Enoch Pratt Free Library, and private archives. Muller has presented widely throughout the DC-Baltimore metropolitan area at venues including the Library of Congress, Newseum, Politics and Prose, American Library in Paris and local universities. He is currently working on a book about the lost history of Frederick Douglass on Maryland’s Eastern Shore. John Muller will be in conversation with Dr. Ida E. Jones, Morgan State University archivist. Have you heard stories of Frederick Douglass stepping through the country roads of Brinklow and Sandy Spring? According to oral tradition Dr. Douglass, an internationally known abolitionist, statesmen, orator and journalist, was known to visit multiple families in our area. 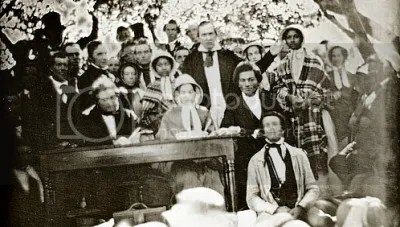 Emily Edmonson Johnson, born an enslaved person in Montgomery County and an escapee of the Pearl in 1848, was photographed with Frederick Douglass and other abolitionist at a convention to protest the 1850 Fugitive Slave Law. 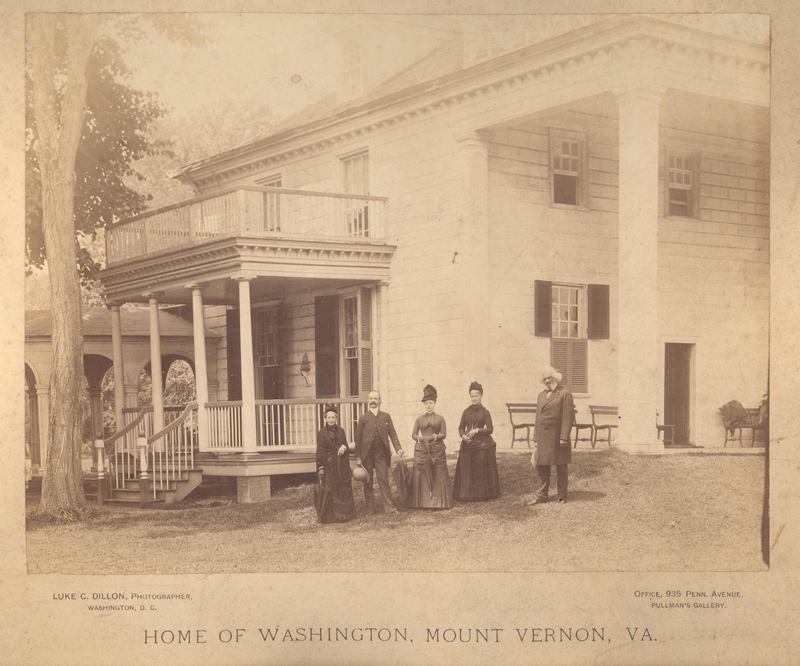 Following her education at Oberlin in Ohio and serving as a teacher at the Miner School in Washington, D.C., Edmonson married Larkin Johnson in the early 1860s and lived in the Sandy Spring community for nearly a decade. She later moved to Hillsdale in Washington, D.C., adjacent to Anacostia where her friend Frederick Douglass lived which is preserved as the Frederick Douglass National Historic Site. 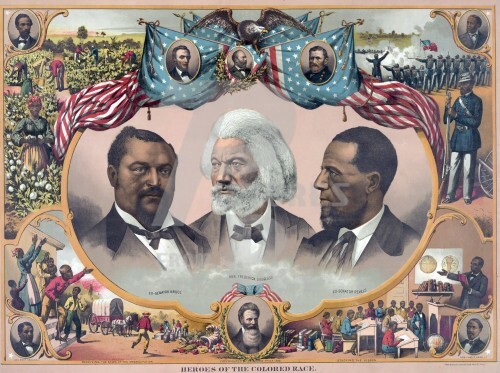 Find out more about Frederick Douglass and his connections from Sharp Street Church to state politics in post-Civil War Maryland and unknown visits to communities from Cumberland to Cambridge. The Maryland Historical Society is pleased to host noted scholar and professor of history at Yale University, David Blight, Ph.D., as he brings his expertise to discuss importance of Frederick Douglass’s life and thought as part of our recognition of Black History month. In light of Douglass’s 200th birthday, and leading to the release of Blight’s upcoming full biography, Frederick Douglass: Prophet of Freedom, this lecture is especially pertinent to today’s discussions. The event is made free of charge to the public through the A. Helen Diggs Memorial Lecture Fund. We look forward to sharing this insightful lecture and commemoration of the life and impactful work of Frederick Douglass with the Maryland community on February 7th. Courtesy of National Park Service, FDNHS. Times: 10 a.m. – 12:00 p.m. Marshal Frederick Douglass delivered an address last evening at the opening of the national bazaar at the Kindergarten hall for benefit of a home for friendless women and girls. 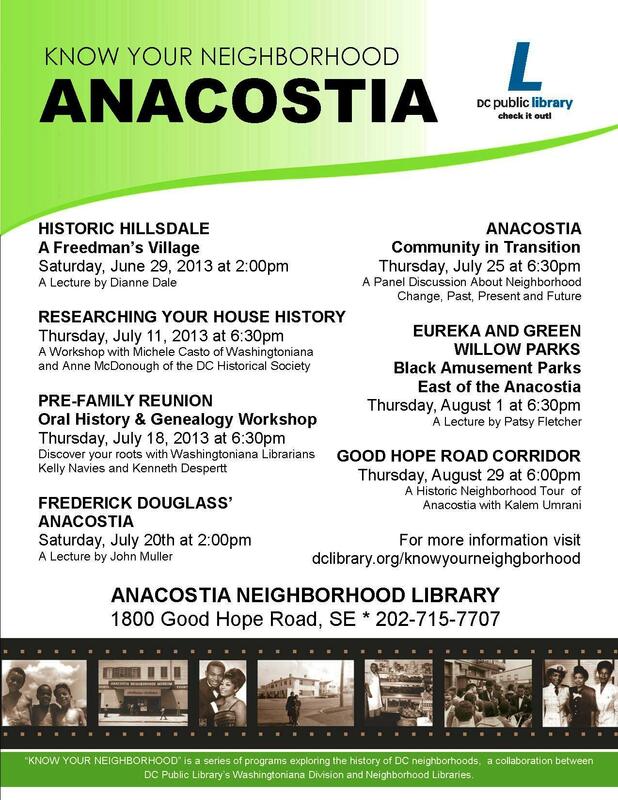 Anacostia Branch of the DC Public Library: “Frederick Douglass’ Anacostia” Sat., July 20th 2:00 p.m.
evaded the detective work of historians. engaging discussion on the community’s history and potential.